1 Tuner + 1 or more non-Tuner monsters If this card is Synchro Summoned: It gains 800 ATK for each card currently in your hand. When this card you control is destroyed by your opponent’s card (by battle or by card effect) and sent to your Graveyard, if all the monsters that were used for the Synchro Summon of this card are in your Graveyard: You can Special Summon all of them, but their effects are negated. You can only use this effect of “Ascension Sky Dragon” once per turn. 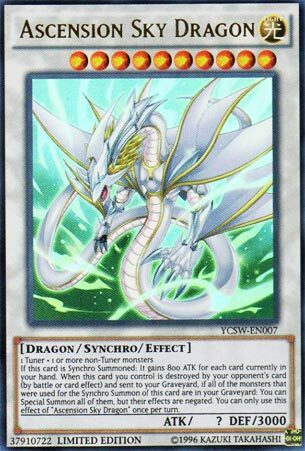 Ascension Sky Dragon, what a name. It’s a Level 10 Light Dragon-type Synchro Monster with ? Atk and 3000 Def. Shield and Sword anyone. The stats are great for a Level 10 if it’s Synchro Summoned properly, which shouldn’t be too hard since it’s generic. If not, you’re left with a whopping 0 Atk, which might not be bad if you want to ram into the opponent and gain the other effect. The Atk boost effect triggers when Ascension Sky Dragon is Synchro Summoned. It gains 800 Atk for each card in your hand. 4 cards is enough for 3200 Atk, less is ok and more is great. If it’s destroyed and sent to your grave by your opponent, you get to Special Summon all the monsters used for its Synchro Summon with their effects negated. An offensive monster with a defensive swarm isn’t too shabby. If only it worked upon being tributed. Ascension Sky Dragon is a well named beautiful monster with an ok Atk boost and an ok death swarm. As a prize card, I wish it did more, or maybe started with 1200 Atk or something. Oh well. Happy Friday! We end this week off with a YCS Prize Card that will get reprinted later this year in the Legendary Hero Decks in the Nordic Deck, Ascension Sky Dragon. ASD is a Level 10 LIGHT Dragon Synchro requiring 1 Tuner and 1+ non-Tuners with ? ATK and 3000 DEF. ? will be based on his effect, but the DEF is at least reliable.The summoning requirements are generic, which is always a plus. LIGHT is a great attribute and Dragon is a great type. Ascension Sky Dragon gains 800 ATK for each card currently in your hand if it is Synchro Summoned. If you summon this with a good amount of hand advantage, you should get some good stats. Summoning this with an empty hand means you leave this in DEF position. When this card is destroyed by the opponent and sent to the GY, if all the monsters you used to Synchro Summon this are in the GY still, you can Special Summon all of them, but their effects are negated. This effect is a hard once per turn. Nice little recovery if this is destroyed, but it is more likely going to be removed by other means. Ascension Sky Dragon isn’t terrible, just don’t put a lot of your resources into it just for it to get Casteled or something. Art: 5/5 Love this artwork, probably the best looking prize card there is. I think I saved the best card for Friday, and I’m surprised we never covered this. This was the Yugioh Championship series prize card from 2014. Ascension Sky Dragon is a Light, Dragon (all systems go so far) that is Level 10 and Synchro Summoned with a Tuner and one or more non-Tuner Monsters. Being Level 10, that’s probably going to cost you three cards total for a Synchro Summon. This card has ? attack but a lovely 3000 defense. Right off the bat, this card gets 800 attack for each card in your Hand. So three cards puts him at a respectable 2400 but even just an extra card at 4 has him up to 3200. (This obviously gets better math friends at 4000 for 5 and 4800 for 6 cards) unlikely as that is. Hand sizes generally get smaller as duels progress, so this card could arguably get worse the longer your game goes. He doesn’t have any protection, and short of the attack/card in hand effect, he doesn’t do much. But when destroyed by Battle OR Card Effect, if all the Monsters you used to Synchro Summon this card exist in the Graveyard, you get to Special Summon them all back to the Field. This is certainly good. As said at open, that’s likely at least three Monsters. You don’t want to unnecessarily over extend on the hope this WILL be destroyed to swarm and get field presence back, but it’s still useful. Note this card has to be sent to the Graveyard to gain that effect, and ALL the pieces have to be there. So if this, or any of them are removed in the process, you just lost the card and gain nothing back. I still like this card. It has plenty of support with and in Dragons, and being Light, can be tremendously strong, and can give you lots of resources back.